Happy Picture Polish Thursday! We had a little heat wave or second summer here and I’m feeling slightly rejuvenated with my bright nail polishes. While you can totally wear any color at any time of the year, I have a tendency to follow the seasons. And just as I was starting to get into darker colors and jewel tones, mother nature decides to crank up the heat to 95 degrees! So decided to go for another bright summery shade to celebrate reaching above 90 for the second time all year! 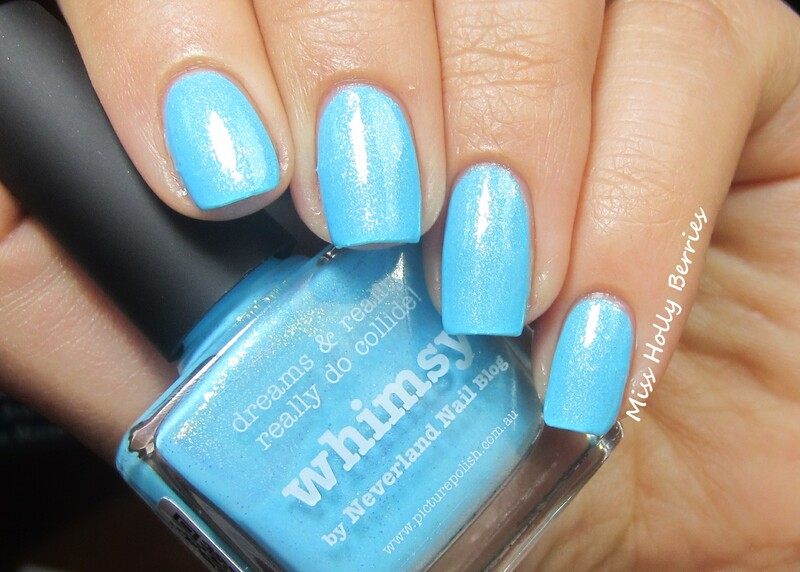 Picture Polish “Whimsy” is a bright sky blue cream with a very strong gold shimmer, which in some lights seems to shift to a green. This is like nothing that I own! 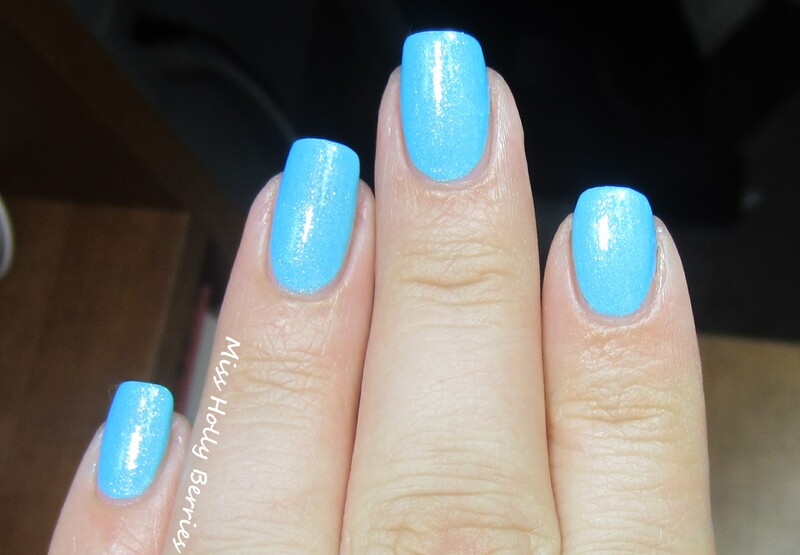 I have a ton of blue with shimmers, but none that have such a strong shimmer that is still visible on the nails. It makes this polish way more unique, and dare I say it a MUST HAVE! The formula on this polish was really nice. It had the perfect consistency that I like, which is a little bit thicker but totally smooth and easy to use. It evened out nicely on the nail and dried REALLY quickly. The only downside was the fact that it took 3 coats to be opaque. But I didn’t really mind that because by the time I was finished painting my last nail, my first was completely dry. It made application a breeze. Also, I’ve been wearing this polish since Tuesday with no chips or tip wear! That is a feat all in itself. SO pretty! I love that it has the gold shimmer!! thanks lu! this one has your name all over it! 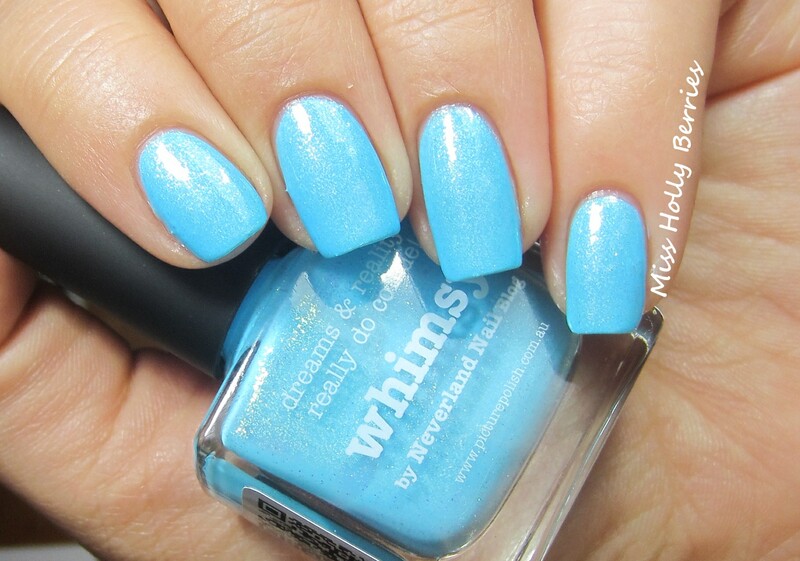 Oh wow, I love this blue!